It is worrisome that despite age-long unilateral and multilateral actions against arms proliferations especially around global flashpoints and vulnerable regions in Africa and the Middle East, the menace is still a bugbear to citizens and governments including Nigeria’s. Which was why despite the efforts of cross-border security agencies like the Police, Customs Service and Immigration Services, borders of African countries recent reports still implicated porous borders all over, allowing illicit arms trafficking, which has resulted in the proliferation of Small Arms and Light Weapons (SALW). What is SALW? ECOWAS Convention on Small Arms and Light Weapons, their Ammunition and other Related Materials of 2006, defines small arms as arms destined for personal use and which include: firearms and other destructive arms or devices such as an exploding bomb, an incendiary bomb or a gas bomb, a grenade, a rocket launcher, a missile, a missile system or a mine. Revolvers and pistols with automatic loading, rifles and carbines, machine guns, assault rifles, light machine guns are also examples of SALW. Although arms proliferation is a global issue, available data on SALW show that out of the 640 million circulating globally, it is estimated that 100 million are found in Africa, about 30 million in sub-Saharan Africa and 8 million in West Africa, alone. The majority of these SALW about 59 per cent are in the hands of civilians, 38 per cent are owned by government armed forces, 2.8 per cent by police and 0.2 per cent by armed groups. This trend has grave implications as African countries have experienced direct, indirect impacts of weapons proliferation as thousands of people, both civilians and military, are killed or injured every year on the continent. Besides, even when death or injury is avoided, SALW proliferation and misuse can impact a community, country or region’s landscape. Indeed illegal arms have led to the rising rate of criminality and citizens are endangered. For instance, it has led to a series of conflicts resulting in the looting of arms and ammunition stocks, violation of human rights, displacement of population and instability of the sub-region. Also, the threat and use of SALW, prevent the delivery of humanitarian and economic aid, and contribute to refugee and internally displaced persons (IDP) populations; and a serious impediment to the socio-economic development of countries in Africa. 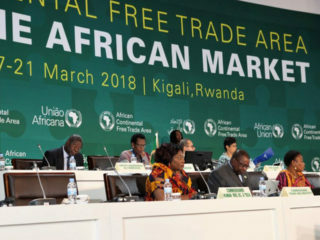 These may account for why the United Nations agencies and the Economic Community of West African States (ECOWAS) at the recent presentation of the survey on SALW, raised some alarm over the proliferation of illicit small arms and light weapons in Africa. They noted that the transnational dimension of proliferation of arms and accompanying crimes undermine development. Therefore, it is not surprising that they claimed they were working towards adopting a strategic plan for addressing illicit circulation of small arms and light weapons. It is not curious that in the calculus of SALW, Nigeria is said to be a source/origin, transit and destination. 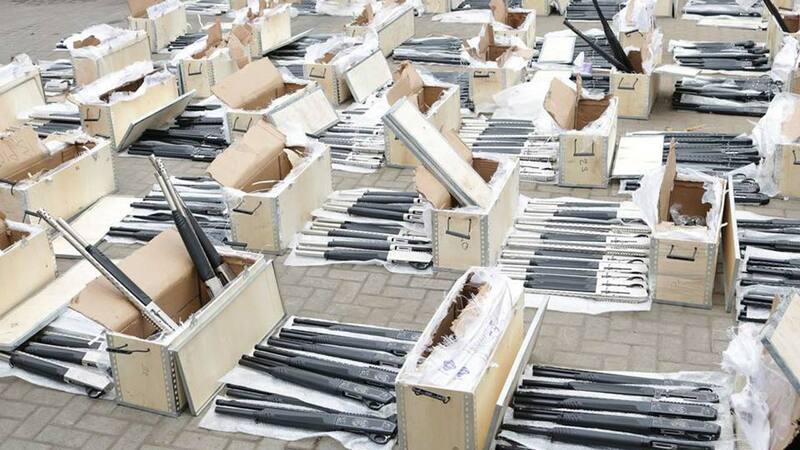 Recently, operatives of the Nigerian Customs Service (NSC) within days intercepted two containers loaded with 1,100 and 470 pieces of pump action rifles respectively, which originated from Turkey at the Tin Can Port, Apapa, Lagos, making a total of 2,671 such arms seized in eight months! What is responsible for SALW proliferation? There have been four reported seizures from Turkey within this year and two within this month. There are pull and push factors responsible for this situation. Some demand or pull factors fuelling the proliferation of SALW include crime, revolts, subversion, sabotage, religious crisis, communal conflicts, social agitations, micro-nationalism, insurrection, terrorism, insurgency, riots, militancy, electoral violence, political violence, social interest, ethnic tensions, cross border smuggling, porous borders, black marketeering, local manufacturing, privatisation of security, insecurity, poverty, economic crisis, mass unemployment, among others. While on the supply side or push factors for the proliferation of SALW, are willing sellers, lucrativeness, and porous borders. Against the backdrop that the inability of the Nigerian state to deal with the demand factors, especially the socio-economic realities that have created dissent, heightened the proliferation of SALW in the country, Nigeria should be proactive and deal with those factors. In addition, the law enforcement agencies should be strengthened to enable them to check the supply factors, which have worsened the security situation in Nigeria where disbarment strategy has not been successful. On the 1,100 and 470 pieces of pump action rifles, which originated from Turkey, government should engage Turkey diplomatically on the issue and ensure that Turkey and implicated Nigerian officials pay some price: It appears that Nigeria is under some threat from Turkey, and the concealed arms should have been discovered in Turkey, the origin country while examining the cargo. 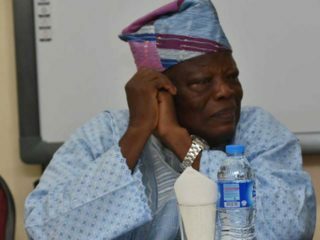 However, that was not done, thereby raising suspicions of external influence on the issue of insecurity in Nigeria. Remarkably, the decision of the UN bodies to address proliferation of SALW in Africa is a welcome development. The global bodies should step up their surveillance function and be more proactive in combating the proliferation of arms in Nigeria, particularly in tackling it from external sources. And such efforts by these responsive UN bodies should be a well-coordinated and comprehensive response based on evidence from research, guidance and support from the Nigerian state. This is a better investment that will reduce the issue of refugee and IDPs, and save lives. Again, this measure will reduce mortality and morbidity that result from the use of arms; compared to the reactive delivery of humanitarian and economic aid. All told, the UN bodies and local operatives should be encouraged by national governments in this noble effort to deal with arms proliferation, especially in Africa, Middle East and indeed Nigeria.